Mary Pierce showed her class to end the hopes of young French compatriot Tatiana Golovin, with a 6-4 6-0 victory in the semi-finals of the Paris Open. Pierce will face Kim Clijsters in the final on Sunday after the Belgian top seed crushed Russian qualifier Dinara Safina 6-1 6-1. 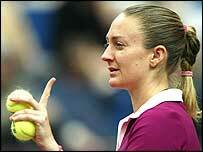 Golovin, who reached the last 16 at the Australian Open, held Pierce for eight games before surrendering her serve. But the 16-year-old lost her way in the second set as her rival's power told. Pierce, who is bidding to end a title drought dating back to the French Open in 2000, was particularly happy with her service games. "We've worked very hard on my serve and the results are showing," said the 29-year-old Pierce. "Only one day left and hopefully I'll go all the way."